I started my veterinary nurse training when I was 16, qualified in 1996 and have continued in the profession ever since. I currently juggle my time between running my own business ‘The friendly pet nurse’, working night shifts at a local Orthopaedic referral centre, studying for my advanced feline behaviour certificate and being a mum to my 5yr old son. You started your ‘Respect the lead’ campaign earlier this month, what made your start this? This is something I feel quite passionate about for a number of reasons but was really highlighted over the New Year holidays when I got involved in an incident at a local beauty spot. We had been on a family walk with my own dog (who sadly spends a lot of time on a lead as he chases deer) and on heading back to the car heard a dog fight quite near to us. My natural instinct kicked in and I ran over to the incident as people were screaming for help. Luckily as I got there the dogs had stopped and I checked them over for any injuries. Fortunately both dogs were ok however sadly one of the owners had been bitten quite badly during the process and needed hospital attention. The incident had occurred after an on lead dog was approached by a very bouncy exuberant dog that persisted to try and jump all over it. The owners kept shouting for the dog to be taken away as there dog that was on the lead could be reactive. Which sadly on this occasion there warnings rang true …..HOWEVER this could have been prevented by the off lead dogs owners acknowledging the request and taking the dog away. I had actually had the same thing happen to me on the walk with the same dog on several occasions bounding up to my dog. So I can imagine how this reactive dog would have felt. My latest rescue dog came off the streets of Croatia and I had to put a lot of work in to training him when he first arrived. He was very reactive on the lead and would lunge at nearly every dog he saw. He was lovely and sociable off lead but as soon as the lead went on he changed. It took a lot of time and persistence but he is so much better now. I am mindful and read my walks watching ahead and so if I sense he will get dashed at when he is on the lead I put my training into place. This works well for my dog but I worry about all the other dogs out there that have their own issues and maybe the owners haven’t been lucky enough to get training help. I felt I wanted to speak out for these owners. During my job as a veterinary nurse I get to see many dogs that have sadly been in dog fights. Many of these can be from on-lead/off lead altercations which unfortunately may have resulted in injury to the owner too. What were your initial hopes when you started the campaign?? 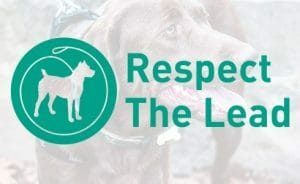 I wanted to try and make dog owners aware that they should be mindful and respectful when out walking especially towards other dogs that may be on a lead. Dogs can be kept on a lead for many different reasons, recovering from surgery, puppies in training, older dogs who may have hearing/sight problems, dogs that are anxious around others, dogs in training….. The list can go on. So with the campaign I wanted to highlight this and to make people realise why a dog on the lead may be uncomfortable when being approached by other dogs. Hopefully this would mean that many dogs and their owners could carry out their walks and have a better understanding of the others around them. How has the campaign been getting on? I have been blown away by the response I have received. It has been shared all over the world on Facebook and I have had so many positive comments and feedback. It seems that it is quite a common problem out there amongst dog owners. What sort of people have you had feedback from? The engagement has been so broad, ranging from dog owners, dog trainers, pet sitters and dog walkers. I have been approached by various companies who are keen to display one of my posters on their public noticeboards. How does your campaign differ from ‘Yellow Dog UK’? The yellow dog campaign is great and many dog owners are aware of the yellow collar/lead/bandana that a dog will show to reflect that they need space. However when you are walking, depending on how far away other dog walkers are you may not see the yellow signage. Or you may have forgotten to bring the correct collar/lead on your dog walk. What would you do…not go on your walk or hope that people are more mindful of the fact that your dog may be on a lead for a reason…so respect that. Have you any handy tips for dog owners who may have dogs that need to stay on their leads? I will always have a pocket full of treats when I am out walking my dog and I think this is vital. As soon as I see a potential problem up ahead I gain my dogs focus and start feeding him some high value reward treats (not their everyday food as that’s dull…something that’s seen as a special treat). The ‘watch me’ command I feel is one that is underestimated and should be trained as much as a ‘sit’ or ‘down’. To start this you hold the treat up to your face and when the dog looks at you, reward. You then add in the ‘watch me’ command. Therefore any time you want to gain your dog’s focus you can use the command. You could also use other commands like ‘touch’ and get them to touch a part of you. Anything really to distract them from what is up ahead, remember you need to be more inviting then whatever is around them. These are things you should be working towards at home when there are no distractions. It is always a harder challenge to gain our dogs focus on us when they are distracted or anxious. If they are finding something too much they will not even eat. If you have a dog which is at this stage in arousal I would definitely seek professional help. Yes it will take time and patience but it will hopefully all pay off in the end. Please remember….don’t set your dog up to fail….you need to work slowly and methodically taking it a step at a time. I would also avoid as much as possible approaching face on to another dog on a lead, this is obviously depending on where you are walking at the time. Even if you arc off slightly and bend your route that will help. Lead to lead encounters can also cause great problems. 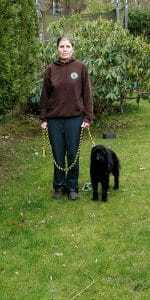 If you do meet someone with all dogs on a lead keep the introductions brief, 3 seconds then go on your way. Don’t let the subtle tension escalate between the dogs that then leads to an outburst. So Zoe, what next for your campaign? I am hoping that with public awareness of the issue and all dog owners being more mindful of the situation we might be able to ensure happy, relaxed dog walks. I would encourage any owner who has problems with their own dog regarding any behaviour issue to seek help from a qualified trainer/behaviourist. There is help out there and many dogs and their owners would benefit greatly if they got some help….am sure the dogs would be thankful for it.